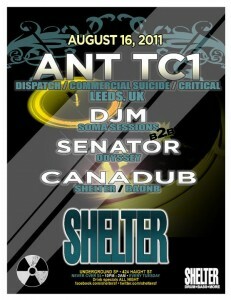 Ant TC1 from Dispatch Recordings will be at Shelter here in SF coming up soon, Tuesday August 16th. Senator and I are going back 2 back opening up, alongside resident Canadub. We have played in support of Ant on previous visits and trust me it will be a proper little night for fans of deep, upfront, rolling Drum & Bass. This entry was posted in Events and tagged ant tc1, canadub, drum & bass, senator, shelter by DJM. Bookmark the permalink.